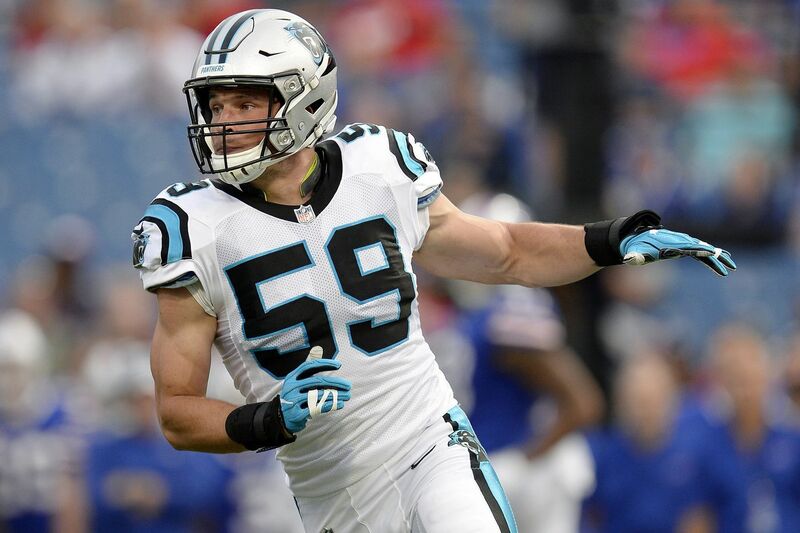 Carolina Panthers linebacker Luke Kuechly ha suffered several concussions during his NFL career. As his helmet collided violently with his opponent's shoulder, Luke Kuechly looked like a life-size bobblehead doll. In an instant, the Carolina Panthers' star linebacker suffered yet another concussion. His season, and perhaps career, was in jeopardy. A few weeks earlier, Kuechly had begun wearing an experimental collar around his neck designed to protect his brain from within. The device, known as the Q-Collar and previously sold as NeuroShield, is designed to mimic the woodpecker's method of injury protection by keeping more blood inside the skull to create a "bubble wrap" effect around the brain. So, why didn't this nature-inspired safety equipment, which Kuechly apparently still wears, prevent his 2017 concussion? As a physiologist and sports medicine researcher, I study how the body responds to exercise and other stressors. I also study ways to prevent and treat sports injuries. As the public learns more about the potential long-term dangers of contact sports, including chronic traumatic encephalopathy (CTE), parents, athletes, and sports organizations are desperate to find a quick fix to the concussion crisis. Unfortunately, I do not think there is an easy solution to make inherently high-risk sports safe. Back in 2014, a friend told me about a study that found NFL players were 20 percent to 30 percent less likely to sustain a concussion in games played at "higher" altitudes. The researchers theorized that higher altitude caused a slight swelling in the brain, and consequently increased brain volume. This "tighter fit" inside the skull would reduce brain "slosh" during impacts to reduce the likelihood of concussions. Since higher altitude seemed to protect the brain, they argued, it would be beneficial to replicate this "tighter fit." The authors proposed this could be achieved by applying slight pressure on the neck's jugular veins to trap a bit more blood inside the brain. A few years earlier, a member of their research team filed a patent for such a device – a jugular compression collar. While those less familiar with physiology may have been persuaded by this fascinating-sounding explanation, my fellow researcher Gerald Zavorsky and I thought this idea was scientifically implausible. Most important, the study defined "higher altitude" as anything above a meager 600 feet above sea level – way too low to have any effect on brain volume. Essentially, our brain volume stays remarkably constant at high altitude, even when we may feel short of breath or lightheaded. In the "Mile High City" of Denver, which houses the highest NFL stadium in the country at 5,280 feet above sea level, you would be hard-pressed to experience even a minuscule swelling in the brain. However, at much higher elevations, there is actually an increased likelihood for brain swelling that causes a life-threatening emergency called high altitude cerebral edema. If altitude does not cause a protective increase in brain volume, then why were concussions reduced in NFL games played at greater than 600 feet above sea level? To answer this question, we examined the same publicly available NFL data set. The original study looked at data from two combined seasons (2012 and 2013), but we analyzed a few additional years. We confirmed that concussion rate was indeed statistically reduced at "higher" altitudes during the 2013 season, but not in the 2012 season. We dug deeper and found no connection between altitude and concussions in the 2014 or 2015 seasons. A separate study in college athletes showed concussions were even more likely at "higher" altitude. Since the effect wasn't consistent and repeatability is a major problem in all of science, we suspected the original linkages were due to random chance – a mathematical artifact of using a huge data set of nearly 1,500 gridiron giants literally butting heads with one another on a weekly basis. If that was the case, we might expect that something completely arbitrary to also be associated with a reduced risk of concussion. And, indeed, our analysis demonstrated that is true. It turns out that NFL teams with animal logos, such as the Miami Dolphins, also had a 20 percent to 30 percent reduced risk of concussion compared with teams without animal logos, such as the Pittsburgh Steelers, regardless of game altitude. Based on our analysis, we concluded that random chance, not physiological response, explains why concussions were less likely at altitudes above 600 feet. Thus, an altitude-mimicking collar seems unjustified for preventing concussions. Supposedly, the Q-Collar also replicates how woodpeckers naturally protect themselves from headaches. According to company information, woodpeckers compress their jugular vein using their neck muscles to induce "tighter fit" and reduce brain "slosh." While this amazing-sounding mechanism is often presented as a fact, it does not seem to be mentioned anywhere in over a century of scientific studies examining woodpeckers. I thoroughly examined all of the woodpecker papers I could find, and then tracked down all of their references, and repeated the process. I discovered ornithology papers from the 1700s through cutting-edge engineering models of woodpecker biomechanics, but none mentioned jugular compression. Thus, it is not surprising that the company does not cite any scientific references to woodpecker literature. Even if this mechanism does exist and has been somehow overlooked by woodpecker researchers, evolution gave the woodpecker numerous unique protective adaptations. I teamed up with a woodpecker researcher and published a summary of these mechanisms in October. These include a specialized skull bone structure and a shock-absorbing beak. Woodpeckers even use very specific postures and movements to brace themselves, which helps to dissipate force away from their brains. We concluded that these multiple protective mechanisms work in harmony, which cannot be replicated by simply pushing on one's jugular vein. New research suggests that woodpeckers may indeed experience brain injuries similar to those seen in humans. Regardless, the physics of woodpecker drumming are quite different than that of sports concussions, which generally happen with unpredictable timing, and involve considerable head rotation. Despite its intuitive appeal, I believe that a woodpecker-mimicking collar is more pseudoscience than innovation. As my colleagues and I have been debunking the scientific rationale for the Q-Collar, research examining the Q-Collar seems to have shifted from reducing the risk of concussions, or distinct events following a single hit, to a less tangible goal of reducing brain damage from repeated subconcussive impacts. New research claims evidence of benefit, based on MRI data. As one article stated in 2016, the collar "may have provided a protective effect against brain microstructural changes after repetitive head impacts." An article published in October from a small study showed that the brains of female soccer players who wore collars for a season seemingly showed no brain damage. Those who did not wear the collar did show small changes in some areas of their brain. However, some other researchers have expressed concerns over the small numbers of subjects and the high dropout rates in similar studies about the collar. Some physicians have concluded that this evidence is not enough to suggest that it does protect the brain from injury and current promotional campaigns are "potentially misleading." I also remain skeptical of these findings, since the clinical utility of this particular type of MRI data remains unclear, especially in relation to long-term health. As the company aims for FDA approval and looks beyond sports applications, I fear that long-term brain health is being placed in equipment justified by misunderstandings of physiology, coincidental relationships, and yes, even what I've concluded are incorrect claims about woodpeckers and other animals. Some may argue that even if it does not work, there is no harm in adding an extra layer of protection. However, I believe this is a dangerous attitude. When athletes feel they are more protected, they have a false sense of extra safety and play more aggressively. This may actually increase risk of injury. As Luke Kuechly and others can attest, even innovative-sounding equipment cannot stop concussions in contact sports. Unfortunately, we may not know if long-term brain damage can actually be limited by new technologies until it is too late. James Smoliga is a professor of physiology in the department of physical therapy at High Point University. This article is republished from The Conversation under a Creative Commons license. Read the original article.